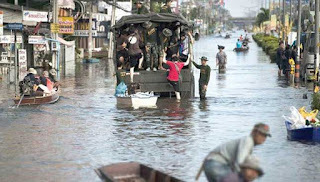 Aizawl, Aug 5 : Non-Governmental Organisations (NGOs) and churches will be collecting donations to help flood victims in the neighbouring state of Manipur and ethnic Mizo inhabited areas of Myanmar. Zo Re-unification Organisation (ZoRO) leader R Zamawia today said the ZoRO convened a meeting of major NGOs and political parties yesterday and agreed to collect donations from the people of Mizoram for helping the flood victims in the Mizo inhabited towns of Kanan, Khampat, Halkha, Falam, Tahan and Kalemyo in Myanmar and several villages in Manipur. Association of singers and musicians - the Mizo Zaimi Insuihkhawmpawl (MZI) and People United to Promote Music (PUMP) would also organise charity concerts on the streets of Aizawl this week to help the flood victims. The Presbyterian Church's Mizoram Synod issued a circular to all local churches asking for donation to help the flood victims in Myanmar and also appealed to the church members to hold special prayer services for flood victims. Meanwhile, Chief Minister Lal Thanhawla sent a condolence message to his Manipur counterpart Ibobi Singh as several died in Chandel district due to the floods. Lal Thanhawla said the people of Mizoram were praying for the people of Manipur at this time of disaster and grief.